Whiskey Tasting Experiences and Tours throughout. WEAR Clothing (we recommend layered clothing, sensible walking shoes, rain jacket and carry bag for daily touring). We will also advise on the dress code for each golf course when required. For more information on this chauffeur vacation, please Contact Us or email our specialist travel planning team on: info@bracktours.com. Prices listed above are based on October 2018. This package is available all year round, and prices are subsequent to availability. Arrive in Ireland (Belfast or Dublin Airport) meet and greet with your tour guide and transfer to your hotel in the medieval village of Carlingford, Co. Louth. While on your way, you will visit the Slane Castle Whiskey Distillery. Spend the evening strolling around the cobbled streets, visit King John’s Castle or take in the views around Carlingford Lough. You will also visit the Cooley Peninsula Whiskey Tasting Experience and Tour. Before you sit down to your welcome dinner and drinks at one of Carlingford’s oldest and most traditional pubs. Enjoy breakfast at the hotel. Transfer to Ardglass Golf Club, home to the world’s oldest clubhouse which dates back to 1405AD. After golf, transfer back to your hotel where you can spend the evening relaxing in some of the famous Irish pubs in Carlingford. Enjoy breakfast at the hotel. Transfer to the world renowned Royal County Down Golf Club. 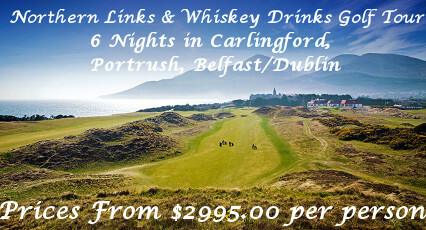 After golf, transfer to your hotel in the picturesque town of Portrush, Northern Ireland. Today you have a planned tour of the Bushmills Whiskey Distillery on the Antrim Coast. Alternatively, you may choose to spend today at your leisure. Visit some of the stunning attractions such as the Giants Causeway, The Carrick-a-Rede Rope Bridge, Dunluce Castle or the Bushmills experience. Return transfer to your Portrush hotel. Enjoy breakfast at the hotel. Transfer to Portstewart Golf Club, host venue to the 2017 Irish Open. After golf, travel back to your hotel to spend the evening as you please. Enjoy breakfast at the hotel. 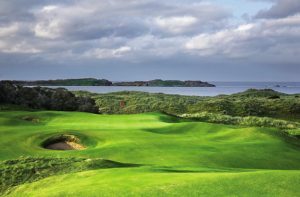 Transfer to Portrush Golf Club, host venue to the 2019 Open Championship. After golf, transfer to your hotel which is located close to your departing airport. Enjoy breakfast at the hotel before departing for the Airport. A Family run hotel located in the Heritage Village of Carlingford, Co. Louth in Ireland’s Ancient East, offering stunning views of Carlingford Lough and the Cooley Mountains. Just 1-hour drive from Dublin and Belfast and 20 minutes drive from Dundalk & 15 minutes from Newry, the hotel is easily accessible, just 15 minutes off the M1 (Exit 18). 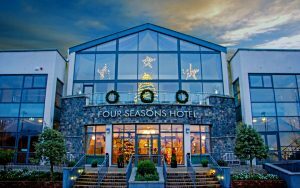 The newly designed four-star Four Seasons Hotel, Spa and Leisure Club Carlingford offers well-appointed accommodation; a luxurious new Luxe Spa, extensive leisure facilities; and a warm Irish Welcome. Making it one of the best hotels to visit in Co. Louth and the perfect location for a fantastic golfing experience. Explore the beauty and wonder of Northern Ireland’s breathtaking coastline on the Atlantic Ocean. Portrush is a favourite seaside resort destination, offering a multitude of attractions and activities. From grand historic castles to challenging golf courses, our town offers something for everyone. Discover excellent local restaurants and pubs, and a vibrant nightlife where the craic is good. Step back in time at the ancient remains of Dunluce Castle. 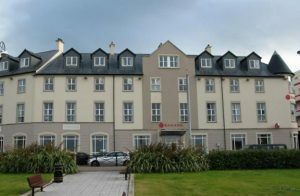 Portrush Atlantic Hotel is convenient to dining, shopping and attractions. We are situated in the centre of town overlooking the Atlantic Ocean. The hotel will be selected once we know the airport that you will be departing from. 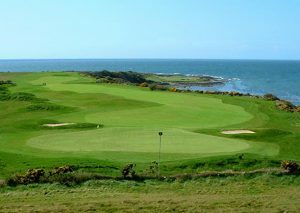 Ardglass Golf Course is an 18 hole links course in a natural setting hugging the north-east coast of Ireland, with stunning views, unique golf holes and memorable people. 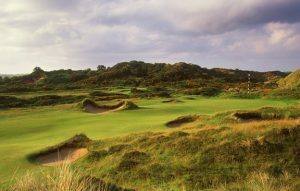 The course is less than 2 hours from Dublin, under an hour from Belfast and only 30 minutes from the world-renowned Royal County Down golf links at Newcastle. 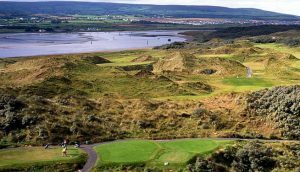 Portstewart is one of the few Clubs in Ireland with three 18 hole golf courses and each offers something different for the Golfer. Click on the images below to learn more.